I grew up in the 500-person village of Srechka in northern Iraq, where education was not valued and teachers were unwilling to teach their students because of language and religious differences. I had to depend on the books the Kurdistan government provided — the books were written in Kurdish, but most of the teachers at my school were only able to speak Arabic. It was up to me to study and learn. One day, that entire world ended for me. I had just finished school and was celebrating being named “student of the year” for achieving the highest GPA. As I was walking home, I saw crowds of people fleeing and screaming and children crying. We had known that ISIS was coming, but now they were only two miles from our village. My friends started running to find their families, fearing that they would be left behind. Drones were flying overhead. Peshmerga fighters [Kurdish forces] were moving in, pushed back by the ISIS advance. After the Iraqi army had folded in the southern city of Mosul, tens of thousands of people fled and were now pouring into our village, desperately heading for the mountains to the north. I don’t remember how I got to my house. My family only had time to grab our passports and IDs. Twelve people piled into our small car, many climbed on the roof. A lot of other people just ran. My family of eight moved to Erbil, where they spoke yet another dialogue of Kurdish called Sorani. The city was full of people who treated me unjustly and judged me based upon my religious beliefs because I am Yazidi, which is a minority religion there. I tried to enroll in school, but they would not accept me without a signed transcript. My father and I had to return to my old village — where ISIS was now only two miles away — so that the principal could sign my transcript. At the top of the mountain, I could see their flags and members of ISIS. It was the most terrifying moment in my life. But it did not stop me from furthering my education. They could never and will not ever do that. That day, my father and I put our lives at risk for me to continue my education. I knew that by going to school, I would have a brighter future. I didn’t want house chores to be my only duty as they were for most other women in my society. I wanted to do something different. I wanted to be able to do anything a boy would do. 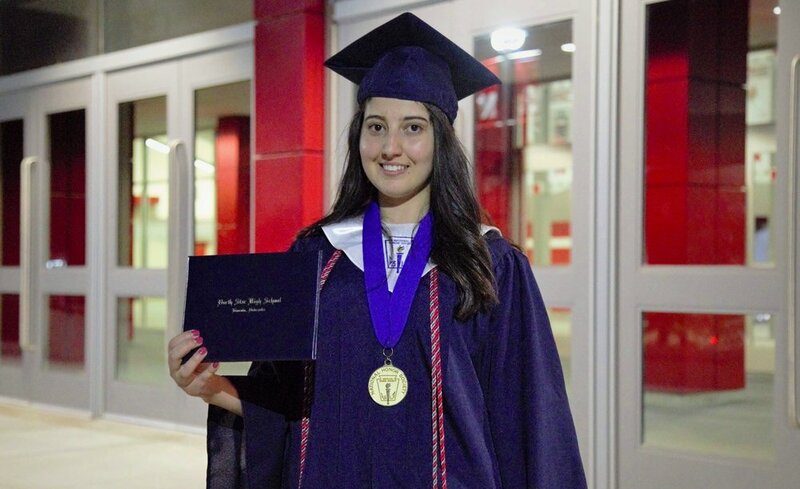 I wanted a good education because I had dreams and goals — and I didn’t want ISIS stopping me. I didn’t want my status as a refugee stopping me. So despite the dangers, I went back and got the principal to sign the transcript. I returned to Erbil and began school again. My new school required me to take a religion class that demonized my religion. Students and teachers alike made derogatory comments about being Yazidi. I was taunted and harassed. It seemed the only difference between the school and the terror of ISIS was that my classmates didn’t have weapons, although it felt like they did. They were using weapons with their words every single day, even in the classroom. I couldn’t and still can't understand the hate. I’m not an alien. I’m not guilty. I’m not a criminal and I have never done a bad thing. All I did was be born a Yazidi and I’m not changing this. People should accept that and respect that, just like I respect anyone’s beliefs. That didn’t happen at all in Iraq. Still, I worked hard and ignored their comments, focusing only on getting an education and good grades. I was grateful to be able to go to school because most of my former classmates from my old village did not make it to a safe place where they could continue their education. Because my father worked with the U.S. Army, we received continuous threats from terrorist groups in Iraq. That was when my family petitioned to come to the U.S. It was a joy-filled moment when I received a visa to the U.S. The dream I prayed for had become a reality — I was leaving a place of wars and hate. I came to a place of peace where everyone smiles at you without even knowing you. I was excited and scared and lost and confused on my first day of high school in the U.S. It seemed impossible, like all my hard work in Iraq had been for nothing and that as a top student, I was back at the starting line. But I enrolled in summer school and I took my dad’s advice to learn 10 words each day, telling him my new words every day when he picked me up. I knew if my English-speaking classmates studied one hour, I would need to study two. I pushed forward. No excuses. Three years ago, I didn’t speak a word of English. Last year, I made it to the quarterfinals of the Nebraska State Debate Championship. In 2018, I gave the commencement speech at my high school graduation. A few minutes before walking on stage, I asked my best friend, Mahsa, if this is all real. I even asked her to pinch me just to make sure this was not just a dream. In my speech, I shared the story of what brought me to the stage and how my parents used to tell me and my siblings that education is "the candle that lights the world.” Both of my parents were denied the right to learn. My father’s parents forced him to drop out of school to work on a farm. My mom only completed second grade because her parents did not see a future for female students. I told my classmates to take their light and brighten the world with their education. Then I turned my tassel, threw my cap and became the first person from my family to graduate high school and the first ever to attend college. I have experienced wars and witnessed the Yazidi genocide. I started a new school where I didn’t speak the language. Through all of this, I have figured out I do not need perfect people, a perfect educational system or a perfect country around me. I’ve discovered all I need is to dream big and work hard for what I believe is right. I have the power to fill a dark world around me with light and make it brighter with knowledge and education. Education is the only light that can make my future brighter. Nibras Khudaida is a 20-year-old student refugee from northern Iraq. She is a freshman at Creighton University where she majors in economics and international relations. Nibras hopes to study international law post-graduation at an Ivy League university so she can advocate for human rights and education.